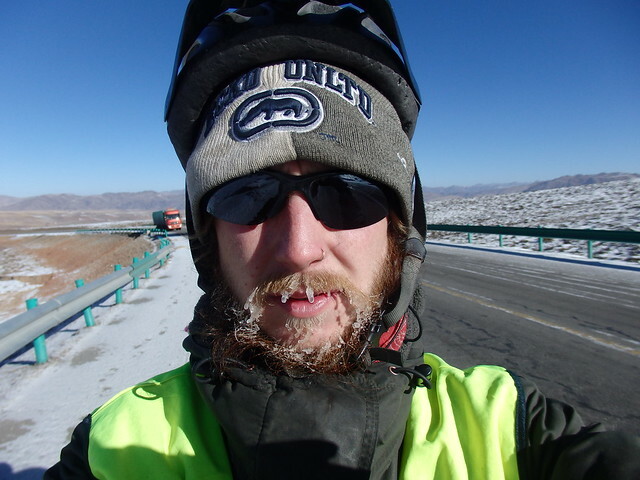 If you are going to be cycling somewhere very cold I’d recommend shaving off the beard! Let’s start with the cold. In hot weather you don’t need expensive clothes, in cold weather you need to invest a little money in the right places. I cycled to Scandinavia in January with useless gear and I was fine, but when I reached my second winter in Central Asia I was totally ill-prepared for the freezing temperatures and suffered in the cold. I bought a down jacket in China from Decathlon. They’re great because they pack up in to very little space. A good quality coat and decent base layer make a huge difference in low temperatures. Sleeping can be a challenge. I had nights as low as -20 which is probably colder than your freezer. That winter I slept with two sleeping bags, but if you were better prepared one should suffice! Our resting temperatures are very different when we sleep. Some people find sleeping bags’ ‘comfort rating’ generous but I will be too cold at least 5C above their marking. A good liner makes a big difference, as does an air mat that keeps you an inch off the ground. You will have a lot of company in your sleeping bag at that temperature. Keep stuff inside that shouldn’t get too cold: water bottles (unless you have a thermos), gas canisters (can have trouble burning if not kept in), electronics (batteries can freeze) and food. Bicycles don’t like the cold either. 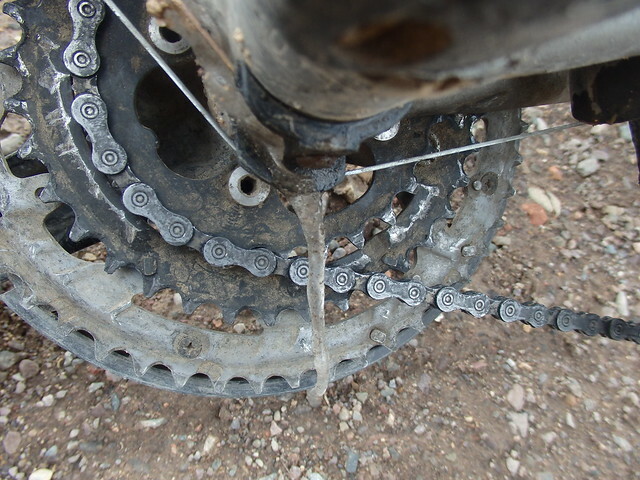 Gear and brake cables freeze and the chain can clog up with ice. In cold temperatures you should carry a thermos – that way you always have hot water to melt the frozen parts. Hot weather is just as dangerous as the cold but much cheaper to deal with. You don’t need expensive clothes in the summer – just less of it! When the sun is strong I wear long sleeves and a sun hat. Nothing is more draining that sunburn and heatstroke can be deadly. If there is water at hand I soak my buff and tie it over my head as often as possible. Keeping water at a drinkable temperature is a challenge, particularly in desert areas where sources are sparse. Wrap a frozen bottle in a tea towel and keep it wet – this way you can keep a bottle cold for a couple of hours. A thermos is just as useful in the hot as it is in the cold! I found the nights very unpleasant in the tropics. The temperature would sit at 30C and the humidity was stifling. 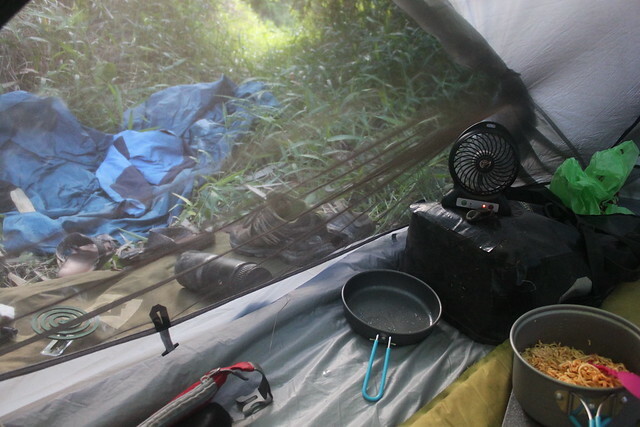 In Myanmar I bought a small USB-powered fan and rested it on a pannier when I went to sleep in my tent. Best 3 quid I have ever spent! Have a little think about what bags you take. The initial thought is ‘completely water-proof ones, of course!’. Most of the time I would agree but they may not be the best option depending on where you are heading. Large chunks of the world are very dry. In those places it may be nicer to have breathable bags. Moisture gets trapped in water tight bags. When my Ortliebs punctured in South East Asia I didn’t realise that the water that had slipped in my rear pannier. When I discovered the mold growing on my coat and sleeping bag I was not in a good mood!